How do you build an online community that isn't an echo chamber and doesn't descend into an ugly shouting match? Make it local, is the answer from two neighbourhood networks, one British, one American, that are getting together. America's Nextdoor will announce this week that it is buying Britain's Streetlife in a multimillion pound deal. Both companies were founded around the same time and have been on a similar mission - to build social networks concentrated on neighbourhoods with the aim of helping people with practical tasks. When I was told about the deal I had two questions - why is what you're doing any different from Facebook, and why is it always the American firm buying the British one and not vice-versa? Streetlife's founder Matthew Boyes started his business when a relative in Battersea in South London had a break-in and couldn't work out an easy way to ask neighbours if they'd seen anything or warn them of the risk to their homes. Image caption Streetlife was created in South London to try to track down details about a local burglary. For Nextdoor's Nirav Tolia it began with a pothole in a San Francisco street and how to get it fixed. Both of them felt that Facebook and other existing networks just did not do the trick. "Social networks are about enabling virtual connections," says Nirav Tolia. "Nextdoor is about reducing the friction of physical world connections." "We don't connect people based on what they are interested in but where they live", says Matthew Boyes. That means you get people with all kinds of interests and different viewpoints. You might think that was a recipe for conflict. But he says the nature of the network has meant that Streetlife conversations - even though they sometimes revolve around local politics - do not quickly descend into rancour and abuse as can happen elsewhere. "I can count on the fingers of one hand the times we've had an issue where we felt we had to step into a conversation." Image caption Unlike Facebook, the connections on these networks are purely geographical. What really marks these networks out is that people don't hide their identity. 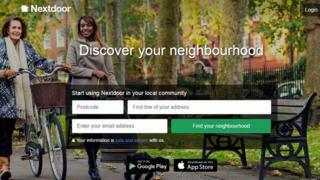 Nextdoor, which describes itself as a private social network, is more rigorous about this than Streetlife, insisting new members of any of its 150,000 communities give proof of their address. "We tell people these are your neighbours - treat them with respect," says Nirav Tolia. "Lack of anonymity creates an incentive to behave better." Following the takeover, Streetlife will encourage its members to migrate to Nextdoor. Which brings me to my second question - why is it obvious that when two businesses start at rightly the same time it's the American one that ends up taking over the world, not the British firm? The obvious answer is that the sheer weight of capital available in Silicon Valley gives entrepreneurs there a huge advantage. Nextdoor has raised $200m at a valuation of $1 billion from the same blue chip venture capital funds which backed the likes of Facebook and Snap. Nirav Tolia told me that on the face of it his idea for thousands of communities that would grow slowly and separately with no real network effective had been the opposite of the kind of "rocketship" Silicon Valley liked to fund a few years back: "but they're not afraid to be counterintuitive." Image caption The founder of Streetlife said he just cared about Battersea, his local neighbourhood. But there is also a marked difference in the ambitions of the two entrepreneurs. My conversation with the Nextdoor founder was full of very Californian talk of transforming a divided world with the power of community. Matthew Boyes, however seemed startled at the idea that he too could have raised vast sums and set off on a global mission. "We never intended to take over the world - we cared about Battersea", he told me. And to be fair, while Nirav Tolia is a serial entrepreneur, Streetlife was Boyes' first startup. Even if he had wanted to expand rapidly, it is unlikely that he would have been able to raise substantial sums in London, and In building a successful and sustainable business he's done much better than most entrepreneurs. Now we have to hope that he and others like him will go on to found more companies with even bigger ambitions.